Are you a fan of the anemone? Have you seen this flower and the gorgeous dark inky centers that make it unique? 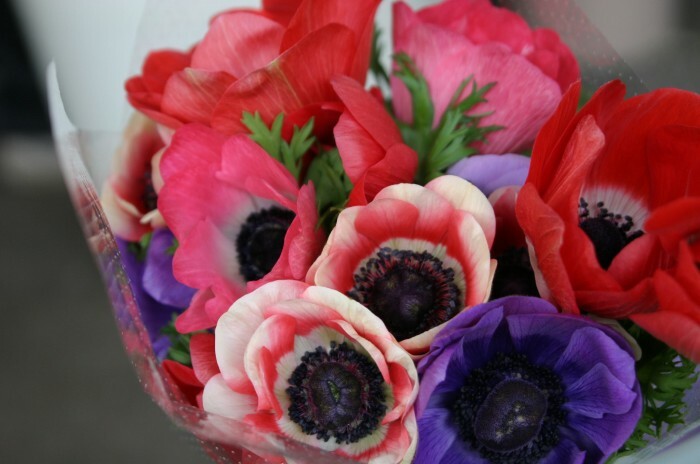 The anemone is one of our favorite flowers. It’s a go-to for us when we’re decorating for a dinner party, baby shower, Christmas gathering, or special luncheon. The anemone brings grace and class to any function. It comes in many colors, but the white and purple blooms are to-die-for in our opinion. Here’s a bit of what we think everyone should know about the lovely anemone. There are actually 120 species of the genus anemone, which is a flowering perennial that grows from tubers. The anemone pops up wild in many European countries. It’s also found in many areas in North America and Japan. Anemones are closely related to the Hepatica and Pasque flowers. Some botanists even include all of these blossoms in the same genus anemone. The name anemone comes from Greek and it means “wind flower.” It was chosen to signify the way the wind blows the anemone petals open and the dead petals away. The anemone’s elongated stem bears one, or several, white, blue, red, purple, or sometimes yellow flowers. The autumn-flowering Japanese anemone is one of the most popular anemone flowers. In herbal medicine, the anemone is used to treat menstrual cramps and problems, such as emotional distress. There are three types of anemone flowers: spring flowering anemone, larger fall flowering anemone, and tuberous Mediterranean anemone. Between all of these, we find that there is a perfect bloom for any occasion. Are you a fan of the anemone? Have you seen this flower and the gorgeous dark inky centers that make it unique?The anemone is one of our favorite flowers. It’s a go-to for us when we’re decorating for a dinner party, baby shower, Christmas gathering, or special luncheon.The anemone brings grace and class to any function. It comes in many colors, but the white and purple blooms are to-die-for in our opinion.